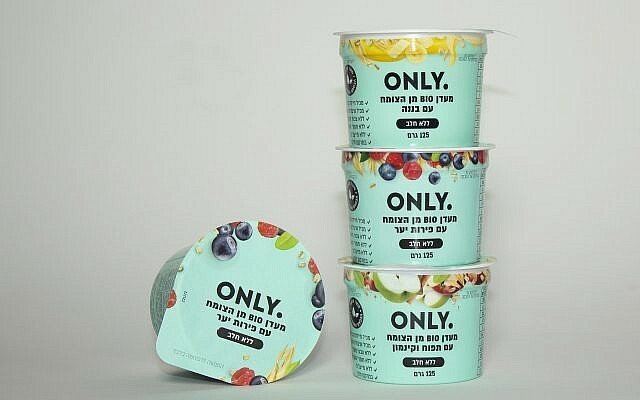 Israeli startup Yofix Probiotics Ltd. has started sales in Israel of its first dairy-free, soy-free range of yogurt alternatives aimed at vegans and lactose-intolerant consumers. The products — whose formulation is based on the fermentation of oats, lentils, sesame seeds, sunflower seeds and coconut — use no processed ingredients, have no additives, colors or flavorings, and come in three flavors: berries, apple & cinnamon and banana & maple. To cater to Israeli taste, the products use refined sugar, but an eventual international version will be sugar-free, using just maple syrup and apple juice as sweeteners. Each yogurt has 5% fat, and has the same or better nutritional value as dairy yogurt, the company says. The new alternative-yogurt line is also environmentally friendly, the company says, with a small carbon footprint because it has no cow milk and, unlike almond or cashew milk which are used to make other alternative yogurts, does not require a great amount of water. The production process is designed for zero waste; all raw materials utilized in production remain in the final product, giving the user a greater sense of fullness. Most dairy alternative yogurts available use a single base ingredient such as soy, almond, or coconut. They are high in fat and low in calcium, iron, and fiber. Also, almond and coconut milk are not high in protein. But Yofix’s Bio 5 formula contains these nutrients naturally, without any need for fortification, the company says. The products nabbed first prize for Yofix at PepsiCo’s European Nutrition Greenhouse Programme 2018 last month. “We take the best of nature,” said Steve Grun, CEO of Yofix, in an interview with The Times of Israel at the firm’s office in Tel Aviv. There is a whole generation of millennials looking for this kind of plant-based product, he said. Behind Yofix is Ronen Lavee, an agricultural mechanical engineer with lactose intolerance. Lavee returned to Israel after eight years in Asia, and could not find a dairy-free yogurt alternative with good flavor and texture. 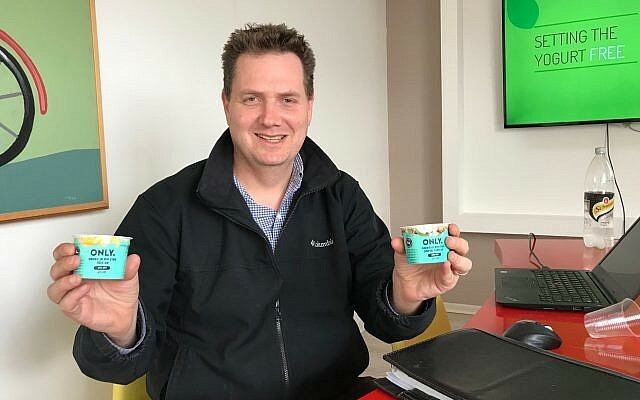 He experimented with more than 100 fermented formulas based on natural ingredients until he found what he calls the “Bio 5 formula,” which without sugar, preservatives or colors, still manages to have the texture and flavor of a yogurt. 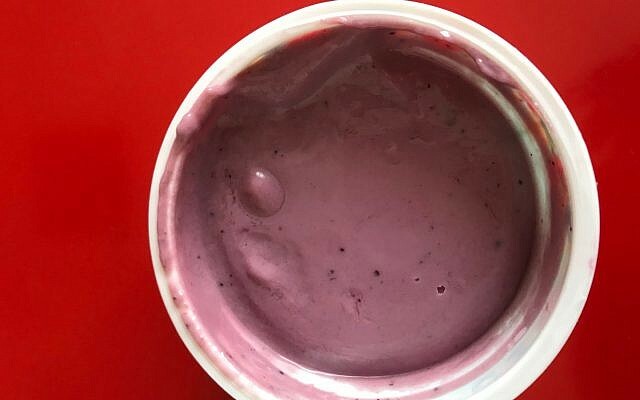 This reporter tasted the berry yogurt first and found the texture a bit thicker than that of a regular fruit yogurt and the taste slightly fermented. The banana and maple, on the other hand, was smooth and very yummy, and the apple and cinnamon was rich, smooth and tasty as well. 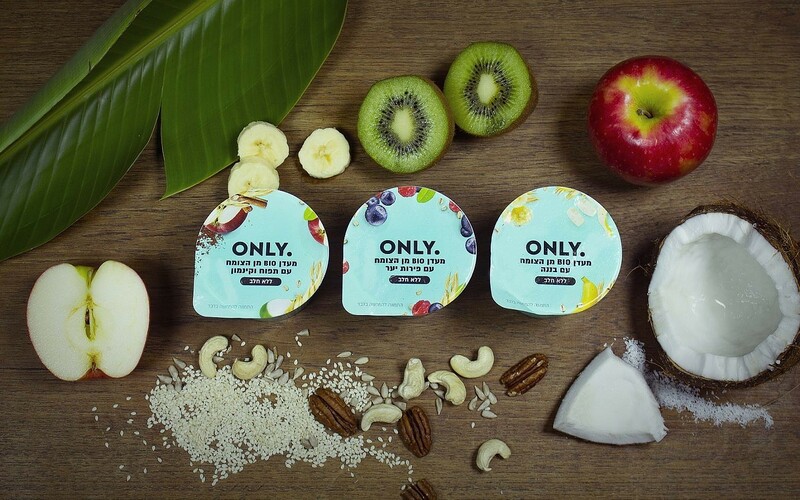 The plant-based yogurt line was launched in Israel with Strauss Dairies at the end of last year under the brand ONLY and can be found in supermarkets around the country. The startup plans to launch its products in Western Europe within a few months, with the US market targeted for 2020. The startup was the first company to join The Kitchen, a food-tech incubator and seed investor in Israel, and is part of the Strauss Group Ltd., the main investor in Yofix. Grun added that the next steps will be to develop new plant-based dairy substitutes for milk, yogurt drinks, cream cheese, coffee creamers and ice cream. “We are aiming to make white natural yogurt as well,” he said. “We can change the balance of key ingredients and perhaps the ingredients themselves,” to make them more or less chunky, and adjust the products to the tastes of the market, he added.